For the record, I am a National League kind of girl. Along with my classmates, I Tomahawk Chopped out the school bus windows the year the Braves went from worst to first. I remember Dale Murphy’s #3 being retired in 1994. In fact, I was the last person to board my flight in Atlanta on June 28, 2013, because I stayed so long watching Chipper’s #10 retire. So my baseball love is Braves followed by my paternal grandmother’s beloved Cardinals. But in case you haven’t noticed…I don’t live in a National League town. Where I do live is in a town that believes (and I MEAN REALLY BELIEVES) in its teams. No matter what (and, let’s be real, Kansas City hasn’t seen many great years recently except for Sporting KC) we love our teams. We believe in the potential of greatness. It’s just on the cusp…or the next game…or the next series…or the next season. I have lived in California, Texas, Georgia, and Montana. From major metropolises of San Francisco and The ATL to a town of 600 in Montana. I have lived a varied life so I can say this with certainty…Kansas City is my favorite place to live in the US. We have everything a city should (arts; sports; education; stellar colleges, universities, and seminaries; restaurants; shopping; culture), AND we have the feel of a cow town. Let me be clear…we are not “just” a cow town with tall buildings. We hold our own. We just feel different than cities to the east. And this National League girl likes that. Kansas City is the place to be right now. We are known as the City of Fountains…which are all now dyed blue. (Watch a little piece about the blue fountains here). 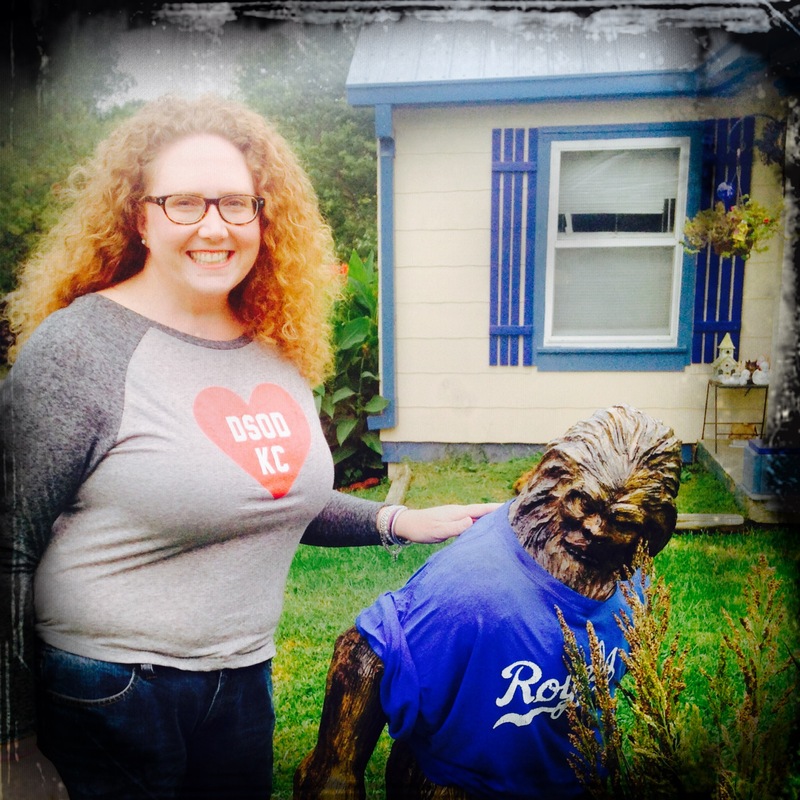 Here’s what I love most about Kansas City…the people. We all do our part to bring the spirit of hope (isn’t that what happens on every Opening Day?). Every day I have a choice on which way I drive to the church where I work. Do I take the straight and quicker way or do I take the winding and slower way through the neighborhood? Every day I choose the slow way. I can keep an eye on how the neighborhood is doing…and then there is this house that make me smile every Monday through Friday. Yes, that is Sasquatch. Since summer, Sasquatch as donned a bikini, a fishing hat and pole, butterfly wings…and now this. Sasquatch bleeds blue and so do I.